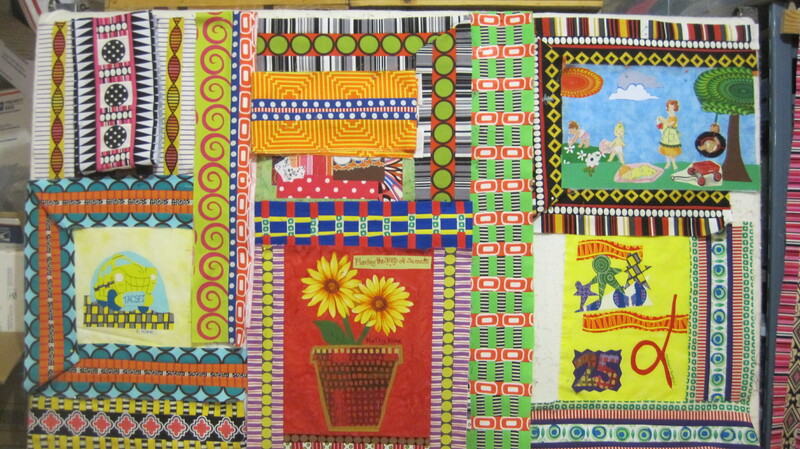 One of my early tricks for justifying spending all my time making quilts was to make baby quilts which eventually grew into the practice of making community quilts. In the spring of 2010, Sarah Leonard, who was at the time the Director of Marketing and Fund Development for thread, contacted me with an idea. 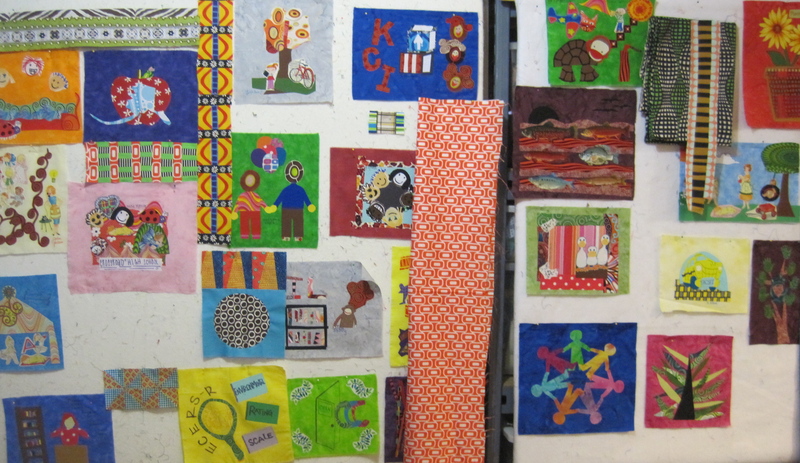 thread was celebrating their 25th anniversary, and they wanted to create a community quilt showcasing their partnerships, their history, and their community. First, I should tell you a bit about thread. The organization, originally called Child Care Connection, was founded in 1985 with the mission of advancing the quality of early education and child development by empowering parents, educating child care professionals, and collaborating with local communities. Okay—you kind of tell I got that info off of their website, but I wanted to get it right. In my mind, thread partners with libraries to help them foster reading programs for youngsters. They help families find quality day care. They provide day care certification programs for child care providers, and many more amazing things. I met with Sarah to plan out the quilt. They wanted to invite their community partners and staff to create quilt blocks representing all the different aspects of thread. On the day of the block party, I brought all my supplies to the thread conference room. I wish I had taken photos, but when I am in middle of facilitating one of these block parties, things can get a little crazy. 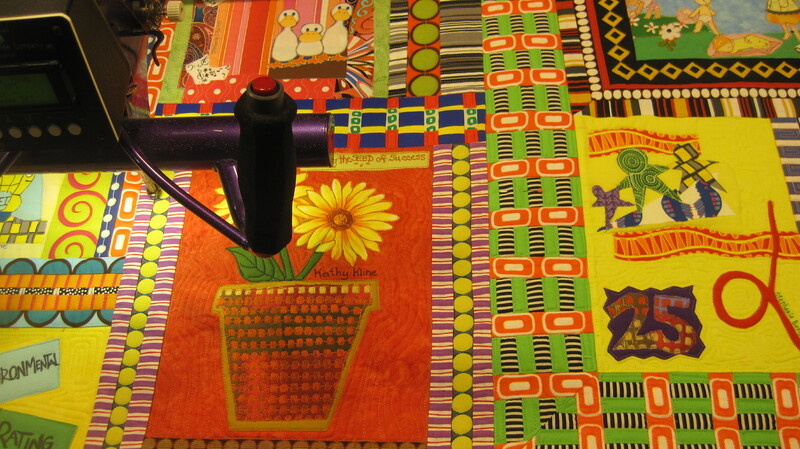 People start gluing the fabric to the ironing board among other things. 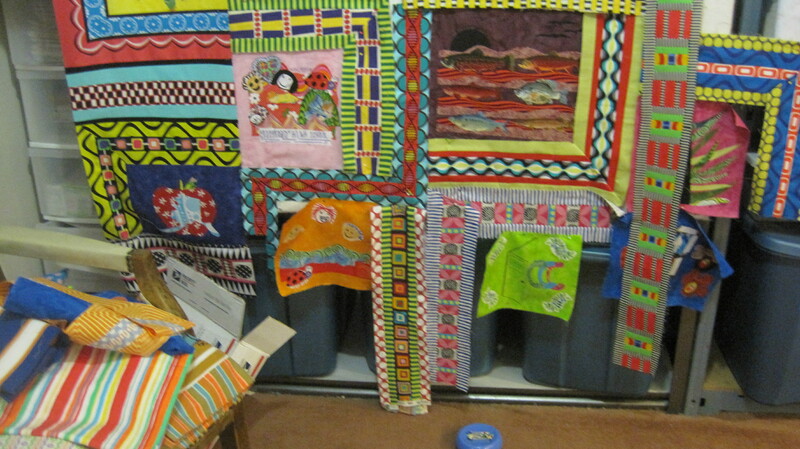 On some level, these community quilt parties unloose adult creativity that for many has been bottle up for way to long. 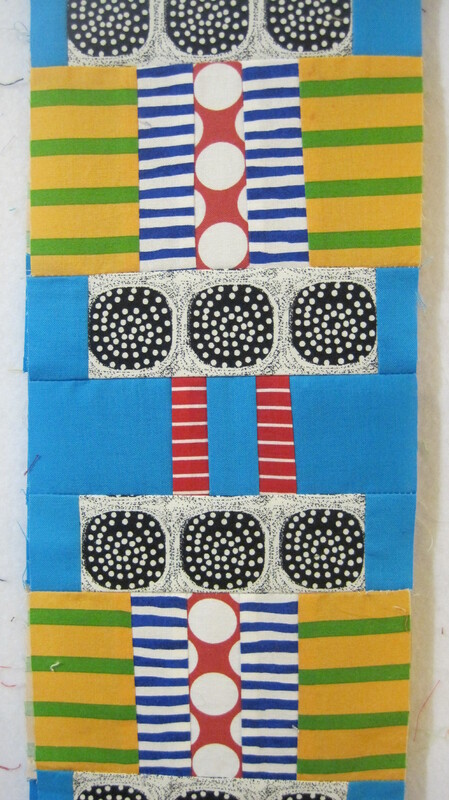 Once the quilt blocks are completed–that is when I really get busy. They go up on my design wall, and I start moving them around. The quilt is in a very early stage here. 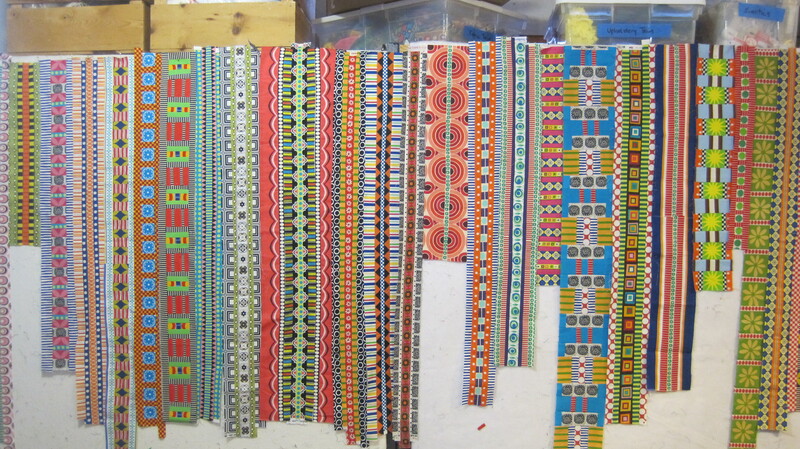 I wanted to create fun and decorative borders for each block in the thread quilt–making a special frame for each one. My first move is always to just put the blocks on the wall and see how they get along with each. Here you can see that I have started to add some of the frames. Making the frames was very labor intensive. 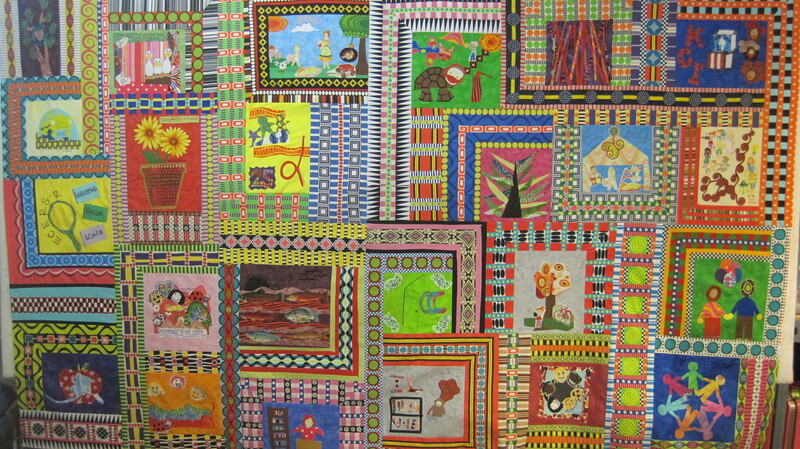 Many of the frames didn’t make the final cut for the thread quilt. Those frames went into my bit bin. What is a bit bin? Well, I think that just might have to be a future post. A nice collection of frames. And here are some more. I made lots of these. It is the sort of work I can do for days and days on end. At some point, my husband tells me I must stop and start to put the quilt together. 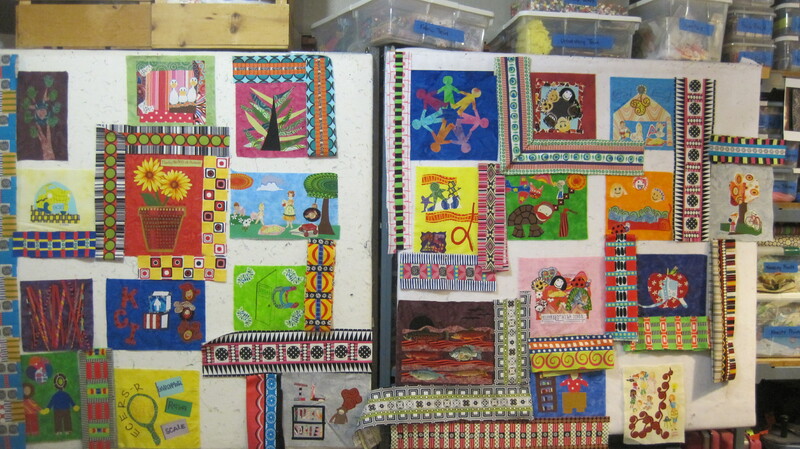 Can you find any of these frames in the finished quilt? Here is a photo of me “auditioning” a group of prints to see if they look good together. 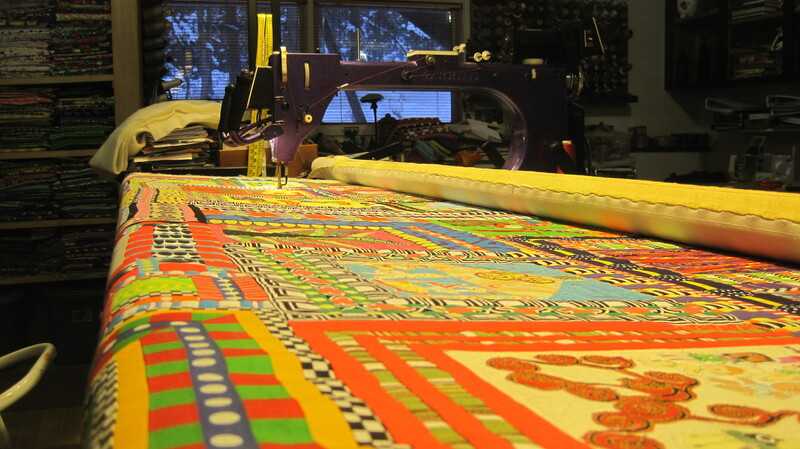 As I continued to work, the quilt began to take shape. Slowly the quilt becomes a single unit. Lots of voices all in one quilt. How do I keep all those different fabrics organized? In one big pile! 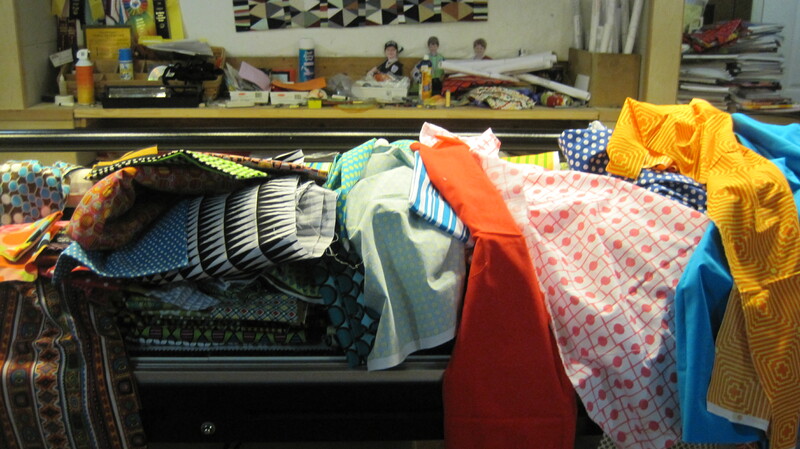 I’m not sure you will believe me, but I really do know where almost every fabric is in that mountain. 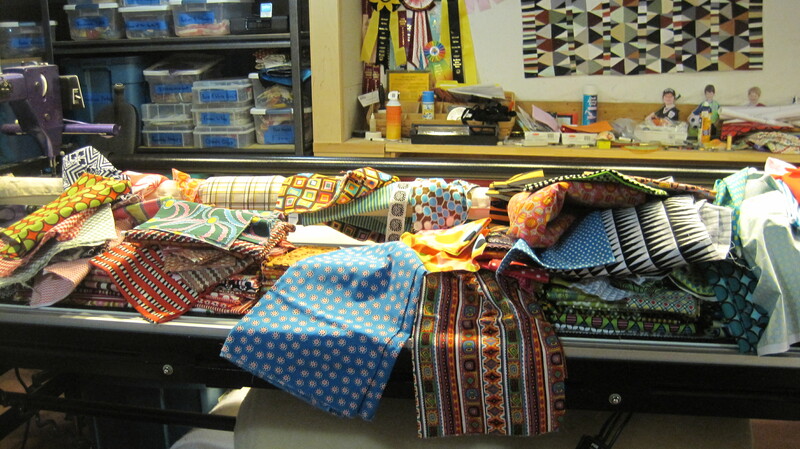 There is a point with every larger quilt that I run out of room on my design wall.This is always problematic. Finally, I finished the top! This is always an exciting moment. I want to celebrate, but there is still a lot more work to do. 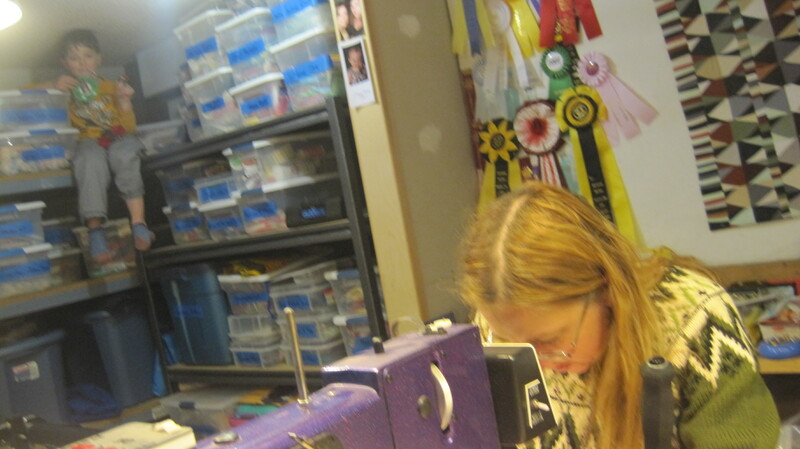 Many, many hours were spent stitching with Priscilla. Notice the gnome up on the shelf and the old school sweater. 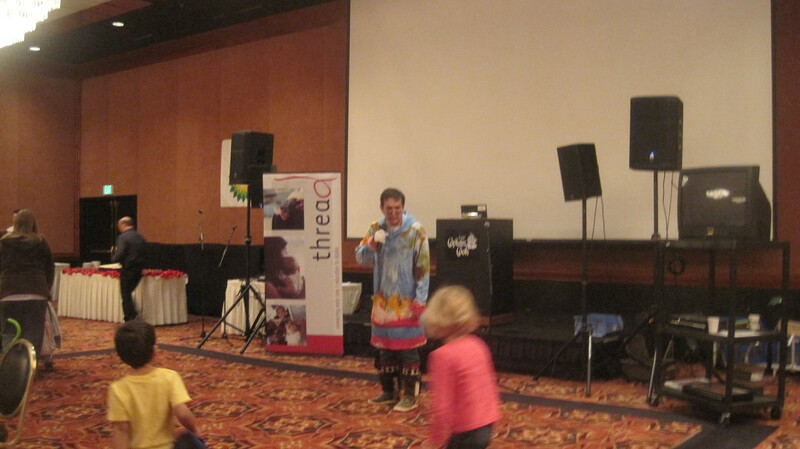 The final event for the 25th anniversary celebration of thread included the unveiling the quilt, a visit from Senator Begich, a performance by story teller Jack Dalton, and much more. 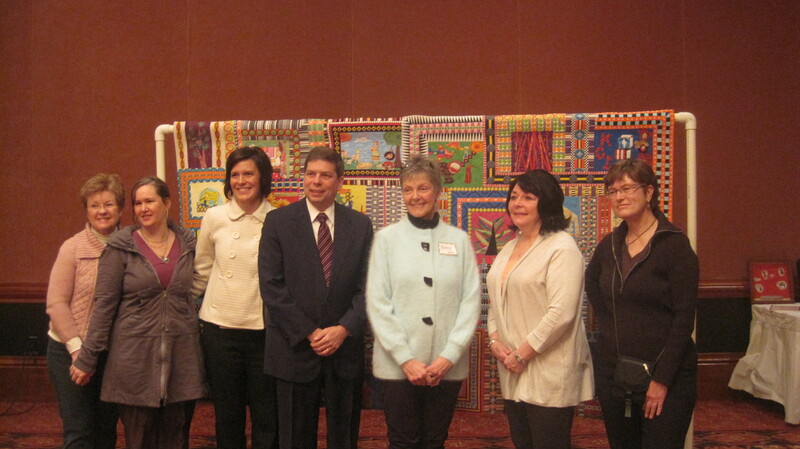 Senator Begich with thread staff and board members. 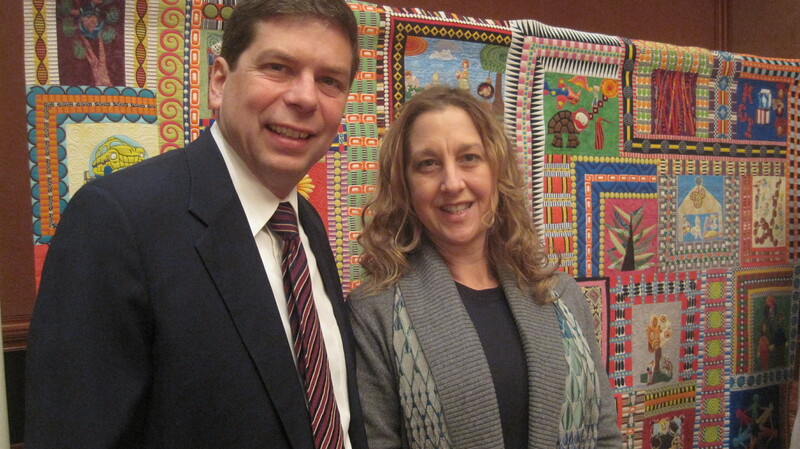 Senator Begich and me. Can you believe it? Jack Dalton working his magic. 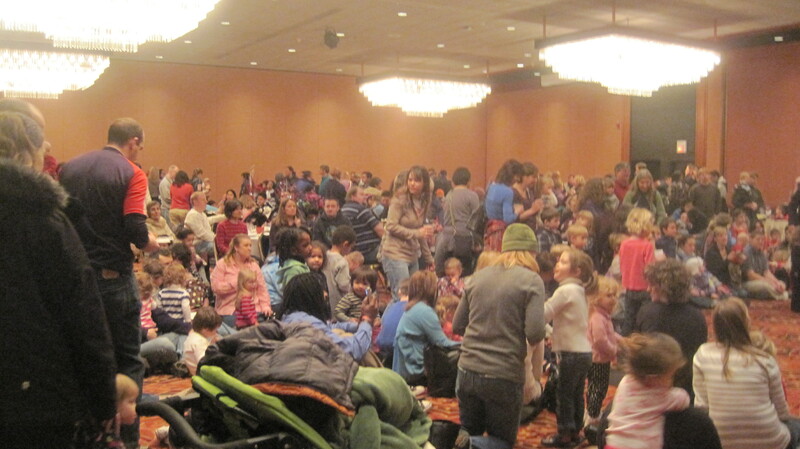 Hundreds of kids and their parents turned out for thread’s 25th birthday party. 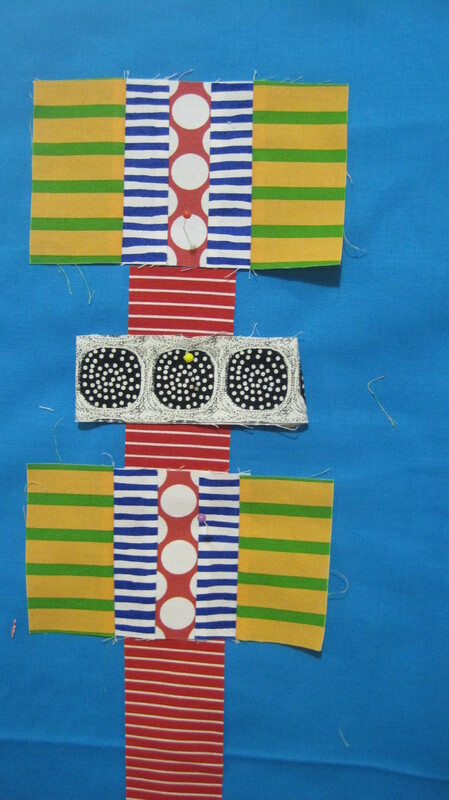 Making the thread Generation’s Quilt was great adventure in community quilt making. I am very grateful to have had the opportunity. 20 Feb	This entry was published on February 20, 2013 at 5:43 PM. 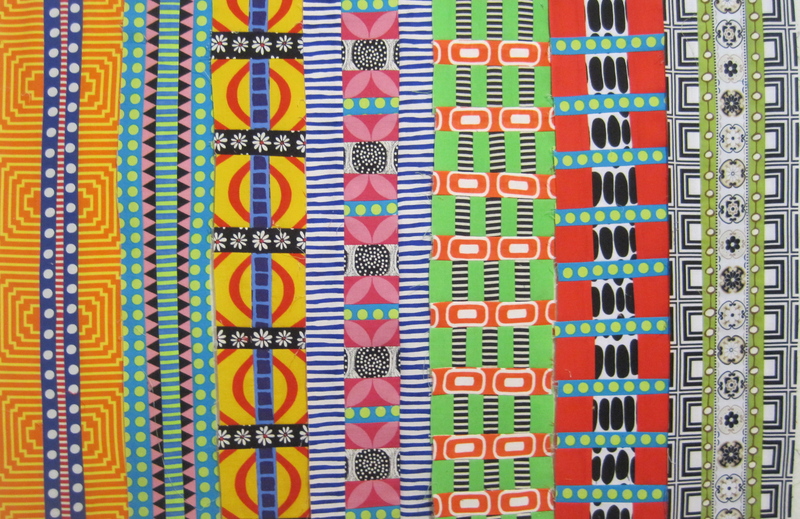 It’s filed under Quilt Stories and tagged Community Quilts. Bookmark the permalink. Follow any comments here with the RSS feed for this post. I’m blown away! Those borders! Each is a little composition, I gather. I wanna come play in your stash! I’ve been reading keeping up with your blog for inspiration, both on the creative front and on the recording of creative process. 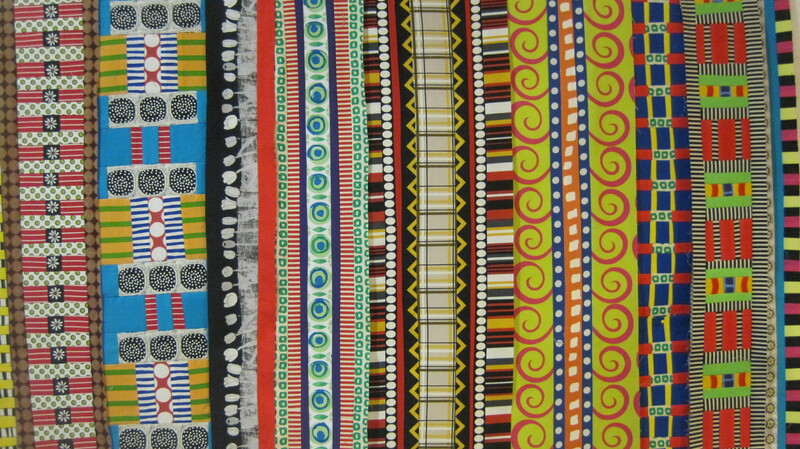 I’ve never seen this amazing quilt. Can you write about switching out thread colors some time? Do you have a method to minimize re-threading your machine? Is there a way to expedite the process? Or am I just revealing my laziness? Hi Petra! On my long arm, I clip the thread near the spool and then tie the new thread to the old thread and pull it through all the hooks and loops and then snip the old thread off and send the new thread through the needle. But on my home machine, I just rethread it each time. I know that might seem crazy. What I usually do is, say I have red thread on the machine. I will quilt all the areas I want to quilt with red thread until the bobbin runs out. Then I will switch to whatever color I think I might want to stitch next. I do that color until the bobbin runs out. I do that up and down the quilt until I am done. You are not lazy! And thank you for reading and commenting.